This turban jewel is a superb example of precious stone setting in jade. In the upper section, emeralds, rubies and crystals are cut to fit each leaf with as many as seven small, shaped rubies on one leaf, though most have only one or two. The veins of the leaves have been carved onto the shaped gemstones before setting. At the back, relief decoration on the surface of the jade also suggests flowers and leaves. A ring behind the large rosette would have held a feather plume, while the stem would have been used to fit the ornament into a turban. Wearing plumes in a turban indicated royal status in the Mughal empire. 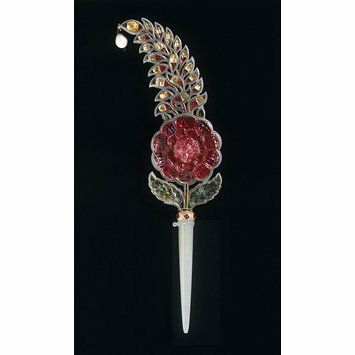 The turban jewel was part of the collection of Indian hardstones, including imperial Mughal artefacts, owned by Colonel Charles Seton Guthrie. He sold much of his collection to the Indian Museum in Leadenhall Street, London, and his objects were transferred in 1879 to this museum. The turban jewel, exceptionally, was a gift by Guthrie to the Indian Museum. 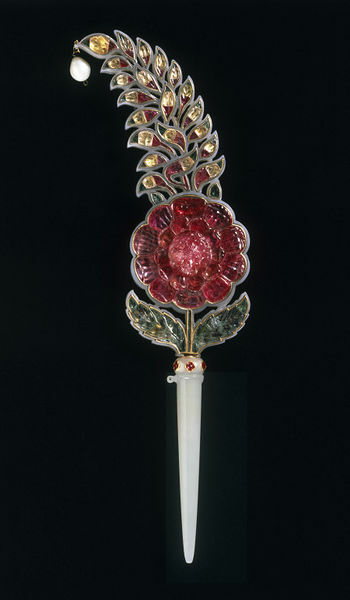 The jewel is made in two sections, the upper part fashioned from a single block of white nephrite jade and worked at the back to include a holder for a feather plume. The setting of gemstones is masterly, with each petal filled by two or three stones carved to fit the curving spaces exactly. The wearing of a plume in the turban indicated royal status. From the collection of Col. Charles Seton Guthrie. Transferred in 1879 from the India Museum to the South Kensington Museum, which later became the Victoria & Albert Museum. Rogers, Emma: Arts of Asia, vol. 45, no. 5, September - October 2015, "The Parasol Foundation Trust Programme: digitising and cataloguing the V&A's South Asian collection. ", p.111, pl. 37. Swallow, D., Stronge, S., Crill, R., Koezuka, T., editor and translator, "The Art of the Indian Courts. Miniature Painting and Decorative Arts", Victoria & Albert Museum and NHK Kinki Media Plan, 1993. The Mughal empire straddled territory including both the modern states of India and Pakistan, which were created as separate entities in 1947. The object could have been made anywhere in the empire.